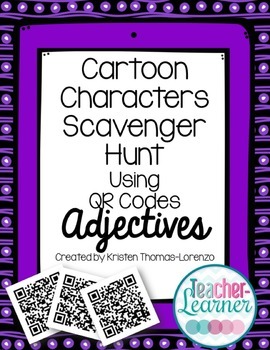 Students scan QR codes that link to descriptions of different cartoon characters. Students will then find the corresponding picture. An engaging way to review adjective vocabulary! Use this activity as a review for adjectives. The pictures can be posted in the classroom or around the classroom. A perfect way to make an otherwise mundane activity more interactive and engaging. Due to copyright and licensing, teachers are required to obtain copies of the images for the cartoon characters that are used for this activity. A list of the characters can be found on page 4 of this packet (Teacher Answer Key). ***The purchased version will have the entire QR code!